Does Fertilizing the Lawn Get Rid of Clover? What Is the Difference Between Tupelo Honey & Clover Honey? Clover is a common weed found in a multitude of lawns across North America. The small plants are re-seeding winter annuals. Clover can easily overtake a lawn and give it an uneven appearance. Clover normally stands out against a lawn because it is a far deeper green then common lawn grasses. Clover can be killed if a diligent regiment is followed. Apply a selective broad-leaf herbicide in the late spring to early summer. Follow the instructions on the herbicide's label for application. Mix in a hand-held pump garden sprayer or a backpack garden sprayer for best results. Apply on a calm day when there is not a great deal of wind. Make sure there is no rain in the forecast for at least 48 hours after application. More then one application will be required for complete control of the clover. Replant grass seed in the areas where the clover once stood. It is important to replant the area so more clover does not take hold and grow. A strong thick lawn is the best defense against clover invasion. Mow the grass regularly at a height of 2 inches to prevent clover growth. Mowing the grass helps the lawn grow thicker and prevents clover growth. Frequent mowing also helps prevent the clover from building seed heads to re-seed. Pull small patches of clover by hand. Discard the plants in a plastic bag promptly. White clover is best planted in spring or summer, but can grow if planted during the fall as well. It often pops up its heart-shaped leaves in gardens, and may be viewed as an invasive weed or embraced as an attractive ground cover. Plant red clover seeds during late summer or early fall for a productive yield compared to winter or springtime sowing. Red clover is often planted as a foraging crop for animals, but is a less effective ground cover plant because it dies after two years. For ground cover clovers such as white or Dutch clover, seed 2 to 8 oz. per 1,000 square feet of soil. 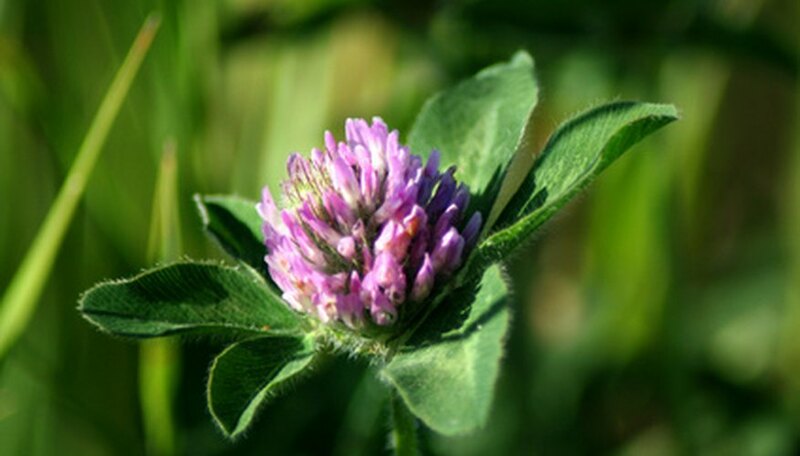 Red clover prefers soil with access to phosphorus and potassium. Control competitive weeds while plants establish themselves. Fertilizing before your grass has had time to green up encourages clover growth, especially if it is already growing. Because grass is dormant in early spring, the clover absorbs the nutrients from the fertilizer to spread throughout the yard. Applying a fertilizer high in nitrogen after the grass has started growing helps the grass compete with the clover growth. You can help the grass regain its foothold in the yard by waiting to fertilize after you see if green up for a few weeks. The right amount of fertilizer can help reduce the amount of clover in the yard. Too much nitrogen burns grass and cause bare spots where clover grows. Too little fertilizer will not give the grass enough nutrients to compete against the clover. Typically, gardeners should use 1 lb. of nitrogen per 1,000 square feet of lawn when they are fertilizing. Apply a broadleaf weed-control product, following the label directions, to eliminate the clover. Continue to apply the product every 14 days until the clover turns brown. Rake the dead clover from the lawn. Plant grass seed in the spots left bare by the clover's demise. Mow the lawn with the blade set at a height of 2 to 3 inches. Grass mowed to 2 to 3 inches grows thicker and chokes out weeds that are growing and prevents new weeds from receiving the water and sunlight they need to thrive. Apply a weed and feed fertilizer in the spring according to the label's directions. Apply two treatments in the summer and one final treatment in the fall to prevent the regrowth of clover during the summer and the following year. Spot-treat small areas of re-emerging clover by spraying vinegar or a weed control product on them. Rake away dead clover and replant grass seed as needed. 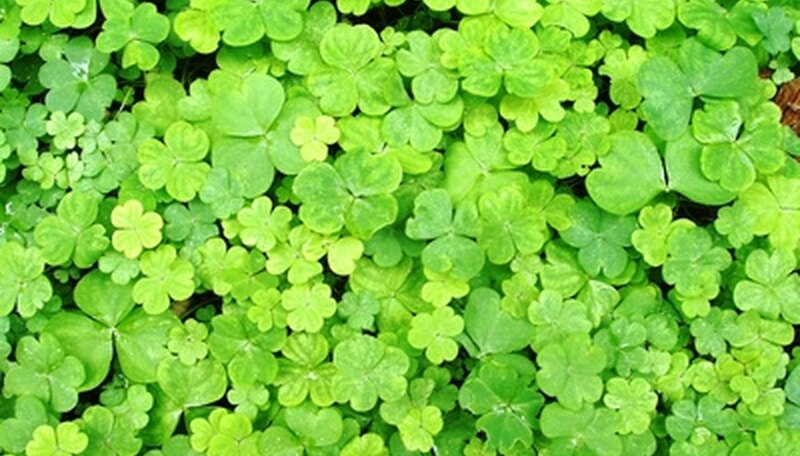 Remove clover by hand if you have a small lawn or a minor clover infestation. Pull out the entire root system to prevent regrowth. 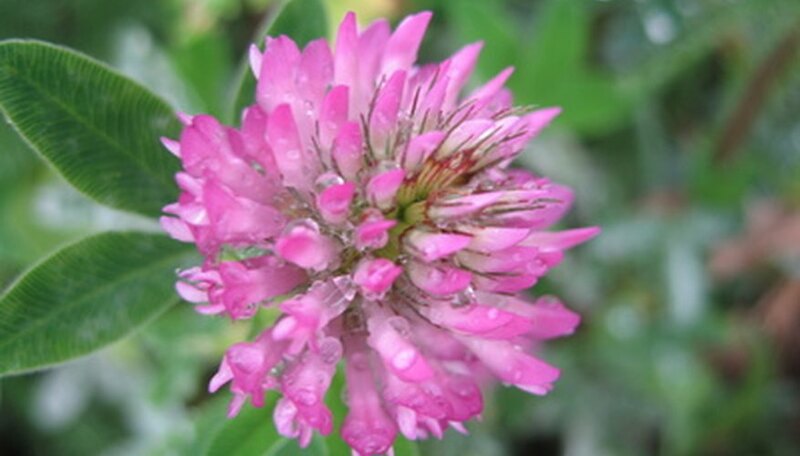 Pull up the red clover and toss it in the garbage, compost pile or local yard waste facility. This works well for small infestations and is easiest to do when the soil is just slightly wet. Rototill the area after the red clover has begun blooming, usually in the spring or summer. This works well for patches that are densely covered in red clover. Mow the clover in the late summer or early fall. Wait four weeks to apply an herbicide (e.g., one that contains glyphosate) that is labeled to kill red clover and is suitable for where your red clover is growing (e.g., your lawn). Follow the directions written on the label for application rate and method. Temperatures during the day should be above 60 degrees F when you apply the herbicide for this method to work. Apply a glyphosate-based spray herbicide to the plot in late summer near the end of the growing season, but when the grass is still actively growing. Re-spray the plot as necessary, according to the manufacturer instructions, until all of the grass dies. If you prefer not to use herbicide, disk-till the soil once, then again at two-week intervals until the grass no longer grows back. Till the soil to a depth of 6 inches once the grass plants die. Re-plant the food plot in early spring as soon as the soil thaws and temperatures warm. Giving the clover a head start will help it out-compete any remaining grass seed in the soil. Kill any grass that sprouts while the clover is germinating and maturing. Use a grass-selective herbicide according to the manufacturer instructions. Switch to a fertilizer with the lowest possible nitrogen levels. Grass thrives on nitrogen in the soil, but clover does not need it to grow. Kill and rejuvenate the clover plot if the grass takes over again. You may have to do this once every five years or so. Break up the surface of the soil in your pasture by going over it once with a power rake. Mix the clover seed with sand. Clover seed is tiny and difficult to broadcast evenly. By mixing it with sand and broadcasting the two together, you can achieve more even coverage of the clover seed. An ideal mixture is 1 part seed volume to 30 parts sand volume. Use a seed broadcaster to broadcast the seed/sand mixture. Broadcast between 2 and 8 ounces of seed (calculated without the sand) per 1,000 square feet of pasture. The more clover seed you spread, the more dominant the clover will be in the pasture. Water the soil daily for about 10 days or until the clover seed establishes itself. You need approximately 8 lbs. of red clover (Trifolium pratense) seed per acre of land. Red clover seed should be planted with grass for the best results, advises the University of Missouri Extension. Apply a post emergent selective herbicide to the clover. The best herbicides to use should contain dicamba or MCPP as they will kill the clover but will not harm your grass. Apply the herbicide according to the directions on your particular product. Check the affected area one day later to make sure the clovers are dead. Depending on your particular herbicide, it may take more than a day to completely kill them off. Sprinkle a thin layer of grass seed over the area once the clover dies. The new addition of grass will fill in any empty spots in the lawn and help reduce the chance new clovers from sprouting. Water the grass seeds every other day to encourage growth. The sooner the new grass comes up, the less likely new weeds will grow. Tupelo honey is a light gold color with a greenish tint. Since tupelo honey contains high fructose, the honey does not crystallize. 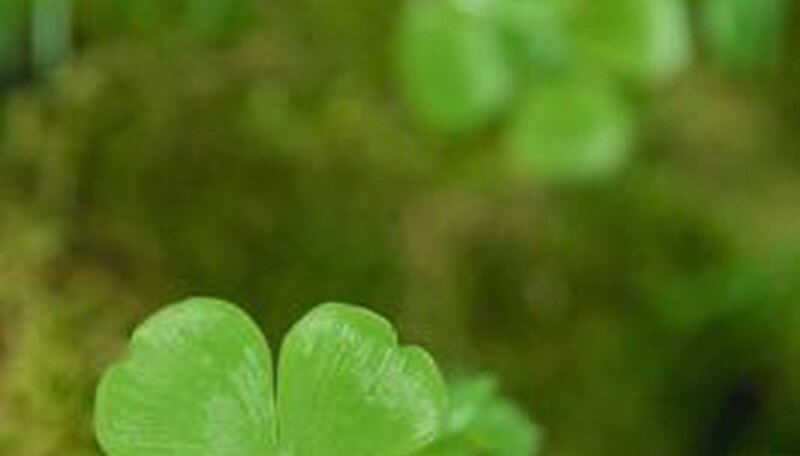 Clover honey takes on the color of brandy and usually comes from white, yellow or red clover. White clover is one of the most common nectar sources available in North America. Warm climate locations in Florida host Ogeechee tupelo trees, used to make tupelo honey. Tupelo trees produce clusters of green flowers full of nectar that attracts the bees. White, red or yellow clover grows in various parts of the country, making it a common nectar substance which bees use to make honey. The flavor of honey differs depending upon the source of nectar the bees collected. Clover honey offers a mild taste. Tupelo honey has a delicate, distinctive flavor. Pour some soil into a wheelbarrow and mix in your clover seeds. Your garden soil is fine for clover. Rake the garden area well, removing any rocks, old roots and other debris. Level the area to remove any lumps or valleys. Spread the seed/soil mixture evenly across the planting area. Cover the soil/seed mixture with 1/4 inch of soil. Try not to walk on it or otherwise pack it down. Water the area with the fine mist setting on your hose or sprinkler, just enough to moisten the top 1/2 inch of soil. Keep the area moist until the seeds germinate, which should occur within two weeks. Once the clover is established, cut down watering to once a week. Crimson clover (Trifolium incarnatum) is the best choice for fast-growing clover in North Carolina. It grows quickly, blooms heavily and dies with the first frost, often reseeding, according to Wildflower Information. Another very common clover, berseem clover (Trifolium alexandrinum), is not well-adapted to the area's hot weather and frosty winters, according to Montana State University.